1804 N. Falmouth Burying Ground. Oldest gravestones of Captain Rueben Nye and Captain Joshua Crowell. 'Lost at Sea'. Cemetery land deeded to the Church by the Nyes 12/6/1827 for $7.50. 1830 First Congregational Church lays down temperance requirement. 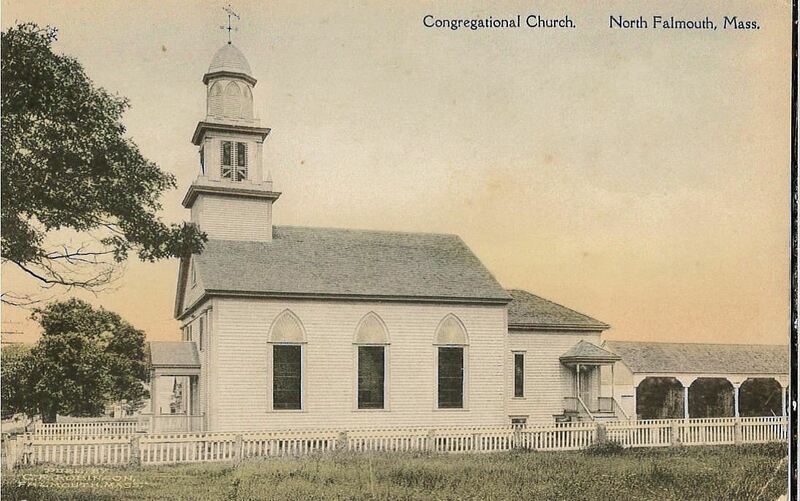 1832 North Falmouth Congregational Society incorporated. 1832 "NF Meeting House erected by Arnold & Martin, Providence, with rounded steeple and Sandwich Universalists' bell, drayed by Samuel Nye. 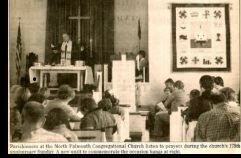 Original membership gathered by 9 souls from First congregational and 12 from East End (Second) Congregational Meeting House (Now part of the Falmouth Jewish Congregation Property). First Service 11/1 or 7/1832. Pews were family owned and custom built. The hand pumped organ was in the chancel. 1833 NFC Society was organized. 1833-4 The Reverend Paul Jewett, first installed Minister. 1836 Fire in funnel (chimney) during Sunday Service, extinguished by Congregants. 1871 Parish horse drawn hearse purchased. 1872 Railroad came through behind cemetery. 1892 Lightning struck the steeple. 1879 NF library begun in church basement and balcony. 1893 Stained glass windows rededicated. 1894 Six horse sheds and two privies erected. 1899 Cemetery iron fence erected. 1899 New organ purchased for $75. 1927 Sanctuary refurbished. chandelier given by the James Rand family. 1928 Altar bible given by the Gibson family. 1934 Church CLOSED in Winter due to the Great Depression. 1935 School House from church burned. Granite markers remain. 1947 Basement and Kitchen redone. cost $4,000. 1959 James Nye parsonage constructed. Old Parsonage sold for $10,300. 1960's Sanctuary refurbished. 1960 New pointed steeple installed. 1961 NFCC 25-0 to join UCC. 1961 Library moved to present NF site. 1965-70 First woman Minister: the Reverend Margaret Blair Johnstone. 1973 Thrift Shop started in the Hatch house. (purchased for &10,000). 1976 Pauline Marsh, a Friend of the bequests approx. $1.4 million. 1981 Latimer family land grant for cemetery expansion. 1982 NFCC Sesquicentennial (150th) celebrated. 1983 Time capsule included in new addition cornerstone. Original NFCC records given to Falmouth Historical Society at Conant House Museum. Treasury notes held by church yielding 11.3%!! 1984 $351,000 Pauline Marsh building dedicated: Nye Room, Rev. Allen C. Best study, 'What-So-Evers' kitchen and Covenant hall. 1985 'What-So-Evers' disbands after 22 years. 1987 New organ installed. Cost $35,000. 1991 Plaques made from parsonage tree. One now hangs in library. 2005 Christian Education addition dedicated. $340,000 cost out of a $540,00 project which included a new pastor's office and other improvements. 2007 Weekend of November 10th 175th anniversary celebrated.